The new range of EuroSeries ESC Short Cased axial blade fans, feature a single shot die cast aluminium blade & external rotor motor design. The EuroSeries ESC range is available in eleven sizes with the extract performances up to 13.89 m³/s, with pressure characteristics of up 300Pa. All units are designed for & fully speed controllable. All sizes shall be supplied with cast aluminium impellers, ensuring performance when working against outdoor conditions and abrasive airflow. 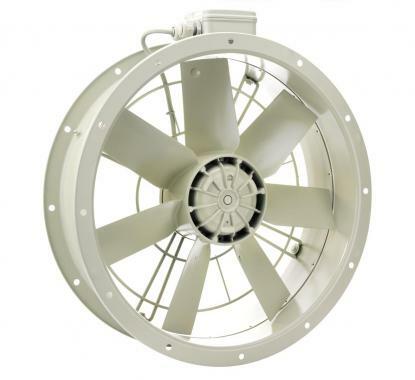 External rotor motors are specially designed and styled for this range of fan. Ball bearings shall be greased for life. Rotors are dynamically balanced to ISO 1940. Sizes 315-1000mm, motors are protected to IP54, against dust and moisture complying with BS EN 60529:1992. They shall be ribbed aluminium body castings for efficient cooling. Motor insluation is Class 'F' (from -40°C to +70°C). Single phase 220-240V 50Hz. Capacitor start and run. Three phase 380-415V 50Hz. An IP54 terminal box shall be supplied with most models with 20mm and PGII entry. All motors shall be fitted with thermal overload Protection which should be wired into all controller circuits and into starter contactors. Models are available with either 2,4, 6 & 8 pole motors. Are to IP54, as standard, protected against dust water jets from any angle allowing outside applications. The fan performance, shall be in accordance with tests to BS848 Part 1 1980. Fan sound levels, measured in a reverberant chamber in accordance with BS848 Part 2 1985. Published dB(A) figures are free field sound pressure levels at 3m with spherical propogation at a reference level of 2 x 10-5 Pa (20 micro-Pascal). The sound power level spectra figures are dB with reference level of 10-12 Watts (1 pico-watt). To ensure minimum noise levels during speed control, an auto transformer speed control is recommended.